the Learning Paths for guidance. Quick Guides to get step-by-step instructions. Want to accelerate your career and show what you know? Add skills you have learned to your LinkedIn profile. Learn how to streamline your accounting processes with Acumatica ERP. Discover how to manage your accounts and run accurate reports. Find out how to effectively track inventory and manage sales and purchase orders in the Distribution suite of Acumatica ERP. Find out how to create and maintain employee records, record employee-related transactions, and implement and process a functional project management design and process flow. Learn how to manage your customers with the help of the built-in CRM module of Acumatica ERP. Get comfortable with Acumatica by watching short videos that will familiarize you with the Acumatica user interface and provide information on Acumatica features. Learn how to configure integration scenarios and create useful generic inquiries, reports, and dashboards. Learn how to install Acumatica ERP, configure its security, and manage the system. Learn the Acumatica platform and how to customize Acumatica ERP to meet the specific needs of your company. Discover how to use OData interface and web services APIs for the integration of Acumatica ERP with external systems. To get access to the Acumatica Customer Portal, ask your partner to provide you with the needed credentials. 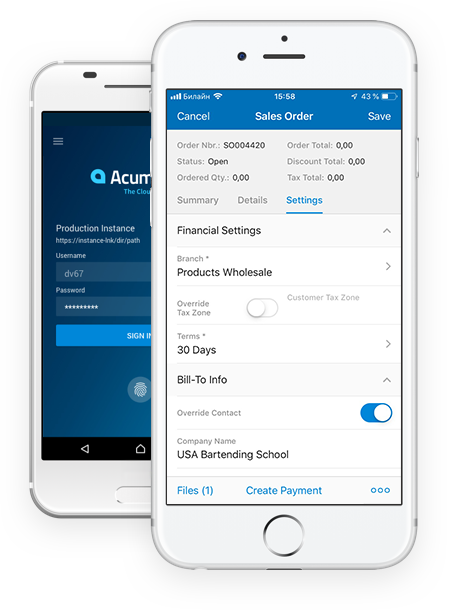 Acumatica’s new native mobile app for iOS and Android devices make it even easier to access and use Acumatica wherever you are.